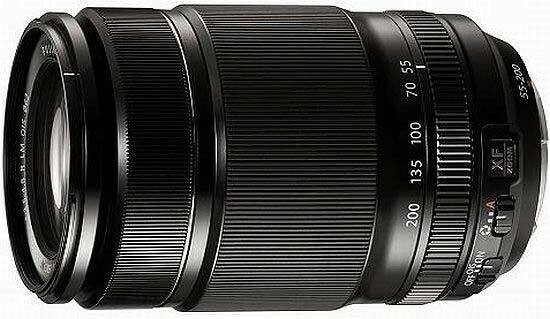 Reviews of the Fujifilm XF 55-200mm F3.5-4.8 R LM OIS from around the web. This telephoto zoom lens for the Fuji X-Pro1 camera provides a field of view equivalent to a 84-305mm lens on a 35mm camera and sports Fujifilm's new linear focusing motor, which promises improved focus speeds and performance. Optical image stabilisation is also included, which promises to allow sharp hand-held images to be taken at shutter speeds up to 4.5 stops slower than without the technology. Fuji always dances to a different drummer. While any of the major camera makers would introduce one or more zoom lenses along with a new camera system, in Fuji's case, when they launched the X-Pro 1 they did so along with three primes. Not a zoom in sight. If I knew the Japanese translation for chutzpah, that's the word that I'd use for such an unconventional marketing strategy.